As you may have figured out from our review, we’re really digging Gameloft’s Asphalt 8: Airborne [Free] and whole heartedly recommend it for anyone looking for an awesome arcade racing experience. With that said, one look at the game’s extensive IAP list and some folks may be hesitant to take the plunge. Thus, the purpose of this guide is to provide some explanation as to what types of IAP are offered in Asphalt 8, whether they’re required to adequately enjoy the game, as well as tips to help folks avoid having to shell out any cash, or, if you must spend something, the most efficient ways to pick up the IAP. Is IAP Necessary to Beat the Game? In a word, no. There are no true pay walls, timers or anything of that sort that would raise a red flag regarding whether IAP is essential. 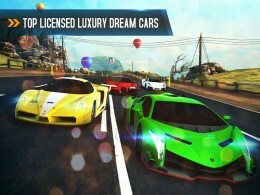 Asphalt 8‘s IAP structure is based on either purchasing ‘car packs,’ which instantly unlock groups of cars that you would otherwise have to use in-game currency to pay for, or purchasing currency outright, allowing you the freedom to buy the cars and upgrades you want without necessarily needing to play and grind on maps. The game also doesn’t feature a dual currency system, meaning the only currency you can buy is the type that is doled out after completing courses and earning stars. It’s relatively straightforward and fair, for the most part. 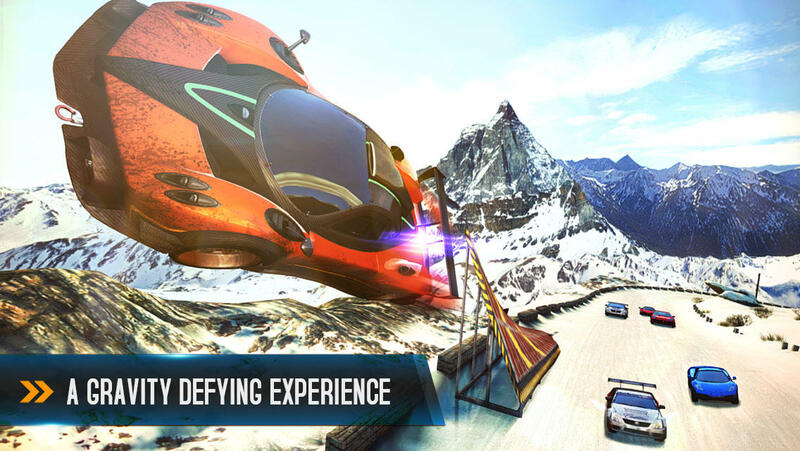 Experienced Players – If you’re generally good at racers and just looking to enjoy what Asphalt 8 has to offer, there will probably be no need to even bother with IAP. As we mentioned in our review, the difficulty curve is pretty fair for the majority of the game, while later ‘seasons’ of races may require some grinding of old maps to earn the amount of currency necessary to purchase and upgrade faster vehicles. However, if you’re good at racing games, this grind will be relatively minimal as the game does a good job of rewarding players who hit map objectives while still earning first place. In fact, unless you’re looking for a specific favorite vehicle that you want right away, you should be fine. Car Collectors (regardless of skill) - If you fall into this category, the quest for car collection is going to make that IAP look mighty tempting. Asphalt 8‘s career mode guides players on the assumption that you’ll buy two or three cars for each racing class, upgrade the heck out of them, and then move on to the next class and start the cycle again. Folks looking to purchase every car in the game will see their progression somewhat stunted as you dedicate money towards purchasing cars in the same class rather than using that money for upgrades or moving on to the next class of vehicles. In addition, while grinding previously played missions offers a fair amount of money, it’s no where near enough to encourage car collection at a reasonable pace. Thus, unless you have the patience of a saint, you’ll probably find yourself shelling out for car packs or currency packs. Beginners – Unfortunately, if you fall into this class, IAP is going to look mighty tempting right from the get go. While Asphalt 8 is accessible from a controls standpoint, players that can’t get into at least the top 3 in a race aren’t going to see much from a money standpoint. This means you’re going to have to grind a lot just to get enough money to upgrade your car to a point where it’s statistically above the competition, which will let you (hopefully) win races more easily, earn stars, and move on to the next round. Picking up a car pack or two (with some high end class cars) or some currency at the onset would allow you to get to that point faster, letting you enjoy the game more regardless of skill set. If you fall in the last group I just mentioned, things may be bleak, but there’s always room for improvement, especially when it comes to driving games. Before you run off and start buying the best cars and tons of cash to pimp your vehicles out, make sure you pay heed to these tips to help improve your skill set. 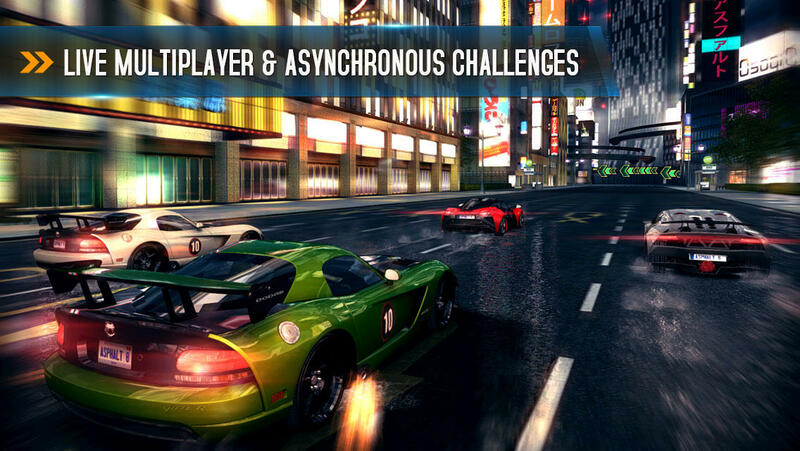 Find Your Control Scheme – Asphalt 8 defaults to a tilt-to-steer control scheme, which I love. However, if you’re not a big fan of accelerometer based driving, there are plenty of other options, including some without auto-acceleration and virtual buttons to control steering. I highly recommend checking them all out to make sure that you have the best one for you. A comfortable control scheme is the foundation for succeeding in a racing game. Master the Drift – One of the best ways to earn a steady supply of nitro is to drift during curves. Drifting is as easy as tapping the break button, which starts the drift (a quick tap will end drift mode). While drifting, you can not only preserve speed during a curve, but you also earn nitro, which, as we mention above, is quite important. Don’t Wreck! – Unfortunately, just as you can put your opponents out of commission, the same can be true for your car. Careen headfirst into a wall or crash into an oncoming big rig and you’ll wreck, taking you out of the race for precious seconds. If you haven’t built up a big lead, this also means that you’ll probably fall far behind. Thus, try to do everything in your power not to wreck. Memorize complicated turns, pay attention to oncoming traffic (they usually blink their lights as they come towards you) and try not to hit a ramp if you don’t know where you’ll land. Explore, Explore, Explore! 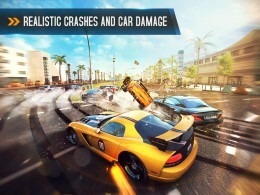 – This is probably one of the most important tips for playing Asphalt 8. Each map has LOADS of alternate routes, shortcuts and hidden passages. Some of them are shorter, longer, and the navigation difficulty varies. In order to ensure victory, you must master these routes and find the one that best fits your driving style while still ensuring you get an edge on the competition. The best way to do that is to simply play each one again and again while taking mental notes of where paths split and where the computer likes to go. Earn Every Star On Each Map – Stars are primarily used as a basis for unlocking new races and seasons, but they are also important from a currency standpoint. Each new star unlocked grants a one-time money bonus at the end of that race. The bonus is also substantial, so players hard up for cash really should take the effort necessary to fully complete each race. Get Those In-game Bonuses – Asphalt 8 provides small monetary bonuses for taking out vehicles, hitting items such as road blocks and cones, narrowly avoiding NPC vehicles, and so on. While each is small individually, they do add up, and become very important towards earning cash when you’ve already exhausted your star bonuses. Thus, I’d recommend trying to do as many of these in-game objectives as you can, with the understanding that you don’t jeopardize your high placement finish (see the next tip). Placement Is Key – Once you’ve earned all the stars on a map, currency is only awarded for place finishes and in-game actions. Thus, it’s in your best interest to consistently get first place on a map to maximize the amount of currency you earn in a race. This will be your bread and butter down the line when you find yourself needing to grind on occasion. Buy Car Packs Early – If you have any thoughts of picking up a car pack while playing Asphalt 8, buy it at the onset. A lot of the car packs include vehicles from every class. If you play a bit, pick up some vehicles and then decide to buy a car pack, there’s a good chance you might have to buy a pack with a vehicle that you’ve already unlocked with in-game currency. Therefore, I’d recommend either buying the car pack early on in the game, or make sure you’ve adequately planned out your upgrade path so you don’t end up ‘double-dipping’ on some vehicles. If Possible Save The Currency For Upgrades – If you’re amenable to both car packs and currency purchases, I’d recommend using the saving your currency for upgrades, as you can’t purchase those outright (as you can with car packs, for example). Also, remember that upgrade costs increase proportionally at later levels, so it’s a good idea to take this into consideration if you’re thinking about buying a currency pack. This entry was posted in asphalt 8 and tagged asphalt 8, asphalt 8 airborne cheats, asphalt 8 guide, asphalt 8 walkthrough on November 12, 2013 by admin. Triggering the Nitro is easy, tap on the right side of the screen. The yellow bar at the top indicates how much you have. You can hit it up to 3 times to activate different power levels, but as the power goes up, so does the Nitro comsuption. PERFECT NITRO. Tapping Nitro once will make a red section appear on the Nitro bar; Tap Nitro again once your Nitro bar reaches that area and you will activate a special boost. How do you turn off Nitro?. You can exit the Nitro boost by tapping on the brake, eentering a drift will also stop it. Filing The Nitro Bar: Fill up your Nitro Bar by executing awesome actions in-game, such as drifts, jumps, knockdowns, City havocs, Traffic Controls, Near Misses, Flat Spins and Barrel Rolls. You will also find Nitro boosts scaterred in different places on the tracks. Exiting Drift: Stop a drift by tapping the brakes or steering the car straight. A quick nitro boost will also pull you out of the drift and around particularly sharp turns. PERFECT RUNS: Perfect runs are bonuses received during a race for clean driving. Dodge opponents and don’t hit any walls for 20 seconds to earn it. Although tracks do repeat time after time along all Seasons, the Race Mode for each one them certainly changes quite often. Besides Classic Mode, you have Knockdown, Gate Drift, Infected and Versus, all of which are explained in detail here. CAR RANKS: Each event in Career Mode has a recommended car rank. Use a car with the recommended rank or above, otherwise you might not be able to win, even if you have your nitro boost activated for most of the race. Credits are what you use to buy new cars and the upgrades you need to push them to the max. Earn credits by playing events in Career Mode and the World Series (ranked online multiplayer), or grab some in the Shop. The Racer Level indicates how you are doing in the multiplayer modes. Play World Series events to earn experience and raise your Racer level. The higher your Racer Level, the more credits you earn in the World series. You can record some events in Career Mode. During these events, you can pick a ghost racer from a list and race against it on the track. Beat the Ghost for extra rewards. Challenge your friends to beat your Ghost and show them who’s the boss. They may not be as flashy as other upgrades, but handling upgrades will make sure you are not crashing every time a curve comes up. The fastest cars benefit the most from upgrading acceleration. What good is a high top speed if it takes too long to get there. HOW TO CHANGE YOUR AVATAR/EMBLEM. You can connect to social networks by accessing your profile (the emblem at the top left of the Main MEnu) and then tapping SOCIAL to set up your social network options. HOW TO DO KNOCKDOWN AN OPPONENT. In order to knockdown and opponent you should be using your nitro. Although you can sometimes ram the opponent without triggering the boost it’s risky and does not guarantee you will “break” the other car. By using Nitro, you can also prevent breaking your own car if you activate it before crashing against a random vehicle on the road. HOW TO DO A FLAT SPIN. Flat spins are performed on regular ramps. You need to enter the ramp while doing a drift, as soon as you exit the ramp, the car will start spinning, how many spins it does depens on the altitude it reaches. HOW TO DO A ROLL BARELL. Roll Barrels are actually easier than flat spins, just enter a curved ramp and make sure the car doesn’t miss it a bit, turning the wheel towards the highest point of the ramp helps doing the barrell roll. The World Series is the multiplayer mode in Asphalt 8 Airborne. This is the only way to Level up, if you were still wondering how. XP points cannot be obtained in single player mode. Once you join the room and while you wait for other players to join, you need to vote for a mode and a track. Singeplayer races are better to farm for credits than multiplayer. You will sure think that it will take forever to to the Tier 2 and Tier 3 upgrades for your cars if you consider the Credits you gain in Season 1 Tracks. However, the amount of credits you gain in the following seasons increase dramatically. The best way to quickly increase your Nitro are Flat Spins, Roll Barrels and Nitro Boosts items. Drifting works perfectly but only on certain parts of the track. Knockdowns are your best friend. Again, use and abuse knockdowns while boosting to take down your opponents, this movement is specially useful when you don’t have a great speed advantage. Taking them off the road for a couple of seconds works great. The Best advice for Gate Drift Races is, keep drifting for as long as you can, it’s not speed what matters, but drifting points, keep tilting your device right and left until you reach the finish line (and pass through all the rings of course). SHORTCUTS: You need to locate and then take the shortcut in every single track, alll the tracks have them and you will have to use them if you want to win in more difficult Seasons. ASPHALT TRACKER: You can see what your friends are up to by accessing the Asphalt Tracker (accessible via the “Friends” icon on the main Menu). Tap on a friend’s wall to race against their ghost!. -The drifting system is easy to learn. Initiate a drift by tapping the left side of the screen, then control the degree of the turn by tiling your device. Once you do this, level out, and after a few seconds, your drift will stop. It’s best to keep this handy for more than one turn, as you’ll go right back into the drift. The more you drift, the more boost you earn. -You’ll want to get as much air as possible. Ramps and barrel roll ramps are available, and the more air you get, the more boost you’ll receive. Hit the boost button a second before you launch off the ramp. You’ll speed up, and the game will automatically store leftover boost power until you land, with additional power included; you’ll always land on your tires. -Be aggressive with enemies. Gameloft introduced the takedown system in Asphalt a few games back, which allows you to wreck competitors by driving into them. With Airborne, it’s a matter of hitting your boost at the right time and ramming the opposition; one hit and they’re done. What’s more, you’ll earn additional boost, which is useful for getting multiple takedowns in succession. -Save some boost power towards the end of the race. Computer-controlled drivers have a habit of blowing past you right before the finish line. With boost, you’ll be able to maintain the lead. -The game provides the option to unlock content earlier, like new season events or specific cars. However, you can eventually unlock the content free-of-charge by playing Asphalt 8. Save the cash for more important things. -Buying individual cars is a great way to beef up your collection, but make sure you check out the Hot Deals tab in the main menu. These offer a great selection of cars – usually 10 or so – for a terrific low price. You can use in-game currency or real cash, but again, things eventually open up the more you play. Hold out for the Tesla Model S and other sports cars – they’re sweet rides. -There are four key areas where you can make improvements to your vehicle – Acceleration, Top Speed, Handling and Nitro. What you upgrade first depends on what you want from your car. If you want to hold more Nitro in the tank, start with that. If you want superior control, go with Handling. However, the main areas you’ll want to tune up first are Acceleration and Top Speed. Other cars have a tendency to go faster than you, and upgrading these two categories will give you superior performance on the road. -Taking part in stunts and jumps isn’t the only way to fill up your Nitro tank. You’ll also discover icons scattered across the tracks that will give you a quick boost. Blue ones fill your tank about a quarter of the way, while glowing yellow ones go halfway. Pick up three in succession and give yourself a full tank. -Boosting runs until the tank is empty. If you can, pick up some extra Nitro canisters while you’re in boost. This will keep it going a few seconds longer, which could make all the difference to scoring a first place victory. -You don’t always have to follow the main track in Asphalt 8. There are various shortcuts that prove useful in three key areas. First, they provide a shorter route than the main path, shaving precious seconds off your race time and giving you a slight lead over the competition – unless they take the same route, obviously. Second, you’ll find jumps that give you air time and much-needed boost energy. Third, you’ll find more Nitro pick-ups in these areas, which you can either use immediately or save for that last-second push towards the finish line. Hey, thanks for checking out my apps. 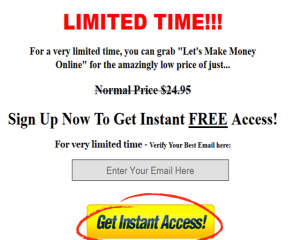 I have been earning income online for buying and reviewing tons of niche products and online apps games. I am also the designer of many innovative income opportunities and evaluate many games apps . Apart from creating my own ebook and making quality guide apps, I have been making good income through affiliate marketing. I have reviewed more than 30 apps games for my online apps business as well as online games. I face the same problems like anyone on many e-book and software games. I pride myself in providing visitors and readers with completely unbiased and honest reviews. I also believe in adding value to my reader’s lives. So I started this guide apps to help my readers/fans to listen the best ways to win unlimited points and advance in level. If you are looking to get information or guides on any products, you’ve come to the right place. I hope it has helped you make the right decision. If you need anything else feel free to contact me .